Horace Mowbray Waltham was born in Barnack, Northants (near Stamford) in 1886. His parents were Herbert (born Barnack) and Emma Catherine (nee Mowbray, born Glinton). By 1901 Herbert had become a gamekeeper on an estate at Easton on the Hill. Horace worked in the gardens at Belton House (under Mr Emerton). He later became head gardener for Mr A S Leslie Meville at Branston Hall, near Lincoln. On 11 Dec 1915 he married Ellen Elizabeth Parker at Belton. They had 2 daughters while living at Branston: Jean Mary and Norah May. 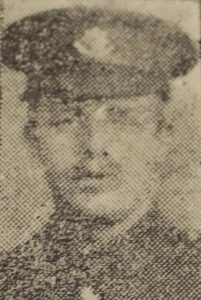 He enlisted on the day of his marriage and was mobilised in Aug 1916. He originally joined the Lincolnshire Regiment but was transferred to 10th Battalion, Middlesex Regiment a few weeks later. He was promoted to L/Cpl in Sep 1917 and Cpl in Nov 1917. In Mar 1918 he transferred to 4th Battalion. He was wounded in action on 9th May 1918 and died in 48 Field Ambulance from a (shrapnel?) wound to the thigh. It’s unclear whether he died on 9th or 12th May. He was buried in Bienvilliers Military Cemetery, South West of Arras. Ellen moved back to Belton and was awarded 26/8 a week widow’s pension. She died in 1953. Their daughter Jean Mary married Cyril Perry in 1940. They may have moved to Hertfordshire. Norah May married Maurice Peatman (1916-1986) in the Grantham area. She died in 1971. Horace’s older brother Charles also became a gardener. In 1901 (age 19) he was working at High Park Gardens, Burghley House. Ten years later he was gardener/foreman on the Luton Hoo estate. He married Maud Cunnington in 1912 and they had 3 children. He died in 1937 at Albert Lodge in Windsor Great Park.